The last of our featured guests, Kaite Welsh, has taken a few minutes to complete The Interrobang Interrogation in time for The First Time tomorrow night. Thanks, Kaite! 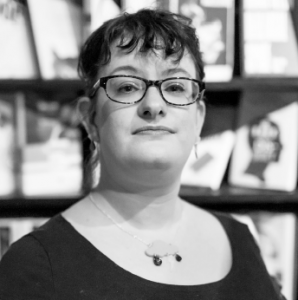 Kaite Welsh is an author, critic and journalist. You may have heard her on BBC Radio 4’s Woman’s Hour. Her novel The Wages of Sin, a feminist historical crime novel set in Victorian Edinburgh, is out from Headline in June 2017. She also throws a cracking Eurovision party. ?! : The theme of the first Interrobang is The First Time. When did you first realise you wanted to write? KW: I remember being around 8 and deciding I was going to be a poet. I stayed up all night once and wrote 26 poems, all of which were dreadful, and several pictures of horses to accompany them although most of the poems weren’t even about horses. People think I’m productive now, but when I was 8 I was on fire. In the end, my poetic abilities didn’t stay with me to adulthood – I was in my first year of uni when I realised that if I wanted to be a writer I had to, you know, write something and spent a few years writing short stories and experimenting with literary fiction (although it turned out that was just a phase). ?! : And what’s the first book you remember reading? ?! : What song would you like as your entry music? Or should we just choose something? KW: My wife and I eloped and I never got a chance to walk down the aisle to The Wedding March, so that or the James Bond theme. It’s my jam. ?! : What are your most and least favourite words? ?! : Anything else you’d like to share with us? KW: My first book, The Wages of Sin, is out next year. It’s a historical feminist crime novel about a fallen woman turned medical student turned detective in 1890s Edinburgh. It’s available for pre-order if you want to get your hands on it the moment it’s published, although like they say in the Bodyform advert, you don’t have to – you just can. Thanks a lot to Kaite for indulging Interrobang’s Interrogation. Come along to Interrobang – The First Time on 7 October and find out why you learned to listen! The next of our featured guests for Interrobang – The First Time, Stuart A. Paterson, has also taken a few minutes to complete The Interrobang Interrogation. Nice one! 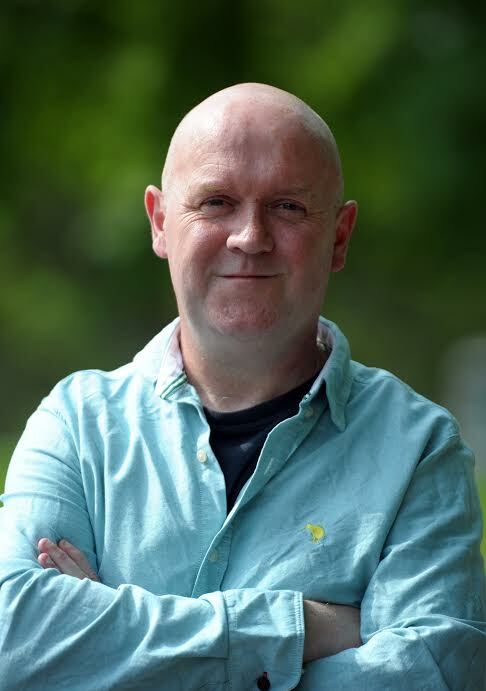 Multi-award-winning poet Stuart A. Paterson’s honours include an Eric Gregory Award from the UK Society of Authors and a Robert Louis Stevenson Fellowship from the Scottish Book Trust. Described by Alan Bold in The Sunday Times as “McGough by way of Morgan,” his latest collection, Aye, is available on Tapsalteerie. ?! : The theme of Interrobang #1 is The First Time. When did you first realise you wanted to be a writer? SAP: I’ve never wanted to be a writer. I’ve written poetry since I was about 12 or 13 & still love doing so, but I wouldn’t describe myself as a poet or writer. I don’t like the stereotyping or pigeonholing such descriptions bring, & besides, I don’t live in a garret. Although I am broke. SAP: Rupert The Bear & the Cloud Pirates. Or maybe The Bible. They’re both pretty intertwined in my memory, which, given the subject matter, is unsurprising really. SAP: Jarama Valley/Bandiera Rosa by The Laggan, from 3.20 in as Bandiera Rosa begins. ?! : What are your favourite and least favourite words? SAP: Allergic to mushrooms. Feeds badgers. Was born in a convent & raised by nuns. Thanks a lot to Stuart for indulging Interrobang’s Interrogation. Come along to Interrobang – The First Time on 7 October and have a right good jig as Stuart takes the stage! The first of our featured guests for Interrobang – The First Time, Ross McCleary, has taken a few minutes to complete The Interrobang Interrogation. Bangin! Ross is from Edinburgh. His work has appeared far and wide, near and a little too close. He has a pamphlet published by Spacecraft Press, and a novella/book/text published by Maudlin House based out of Illinois. How cool is that? 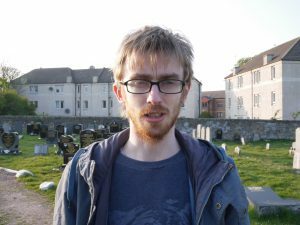 He is a writer for poets against humanity, an organiser for Inky Fingers, and an editor of podcast journal Lies, Dreaming. RMcC: I don’t think I ever didn’t want to write. I remember writing when I was very young, then again in my teens, and beyond. There are huge weird gaps where I didn’t but those are hard to remember insofar as I can’t explain why I didn’t write in those periods. Some time after university I began to write on a semi-regular basis. Then some time after that, at some point caught between writing and not writing, I chose writing and after that I’ve tended to write every day. So while I haven’t ever not wanted to write, there have been periods in which I’ve had to rediscover the need to write that I have always had. RMcC: The Worst Witch? Or maybe a Roald Dahl one? I reckon it’s likely that my first book was one of those Magic Key books – there was one where they get shrunk down and go inside a dolls house. That’s probably one of the first. RMcC: Hmmm. I’ll get back to you on this, but I’d be intrigued to know what you thought would suit! ?! : In honour of the Artist of your book on Maudlin Press, and in light of your alleged Billy Crystalness, how about This Charming Man? Or What (S)he Said [see next question]? …Yep, we’re feeling the second one…?! RMcC: Most – Expression. My favourite words come and go. Least – The refrain in my book is “he says” and because I have performed it a lot I now hate the word “says” . RMcC: I’m probably going to be reading something about working in an office and I wrote this instead of working so if I am unemployed by the time the night comes around you’ll know why. Thanks a lot to Ross for indulging Interrobang’s Interrogation. Come along to Interrobang – The First Time on 7 October and find out whether Ross is still employed!